Book a Maui Bike Rental Reservation Faster and Easier! Maui bicycle rental reservations at West Maui Cycles in Lahaina. Renting a bike in Maui is easy!West Maui Cycles in Lahaina Hawaii has made it easier than ever to reserve a bicycle rental on Maui before your arrival. Our web site bike reservation system provides you with the ability to reserve a rental bicycle in a variety of sizes. Even when the mood strikes you to rent a bike spontaneously while already enjoying your Maui vacation, you can use the Maui bicycle rental reservation system too! Next day and same day reservations and walk-ins are always welcome at West Maui Cycles. Our extensive Maui bicycle rental inventory with options to select the bicycle rental and specific size options based on your dates of rental is at your fingertips whenever you are ready to reserve a bike rental on Maui. Our Maui bike rental selection includes performance road bikes by Specialized, high performance mountain bike rentals (full suspension and hardtails), Electra cruiser bike rentals for riding around Lahaina or Kaanapali, high performance tandem bicycle rentals and the newest addition to our tandem rental fleet, the Electra Hellbetty cruiser tandem bicycle rental! In addition to making it easy for our customers to reserve a bike rental on Maui, our new reservation will speed you through the checkout and checkin process, leaving you even more time to enjoy your Maui bike rides. 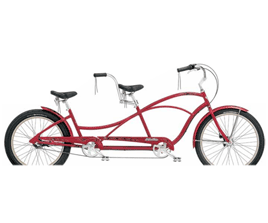 Visit our web site rental section, select the bike to rent on Maui, select the dates you want to rent your bicycle and pick the size. Add your personal information and book the reservation - It's really that easy!! Our system will send you a message confirming your Maui bike rental reservation is being processed. Shortly before your bike reservation, another message is sent with final details regarding your bike rental on Maui. Are you ready to book a Maui bicycle rental reservation NOW? Please use the comments section below to let us know if you like the reservation system or to ask any questions about renting a bike on Maui. We also perform bike repairs and service at our Maui bike store in Lahaina! Subscribe to our Maui bike blog to keep up with the latest Maui biking news and Maui bike ride information. My head is still brimming with all the info about the new bikes and bike gear after returning from the Specialized bicycle dealers preview event in Utah last week. Specialized is certainly not resting on laurels when it comes to mountain biking innovation on their StumpJumper mountain bikes! While the Specialized StumpJumper has already enjoyed 30 years as a leading mountain bike, Specialized continues buildling upon the rich history with the latest mountain bike technology. Our performance mountain bike rentals include the full suspension Specialized Stumpjumper FSR and the Specialized StumpJumper Comp 29'er Hardtail. For 2013, Specialized kept to their StumpJumper mountain bike traditions by introducing new bikes and including innovative enhancements to the existing models! Specialized made almost every model of their StumpJumper mountain bike available for the dealers to get acquainted with and experience demo rides during heir annual bike dealer event at Snowbird. There were plenty of Specialized StumpJumper Expert Carbon mountain bikes on hand, some equipped with 26 in wheels. Thats right, one of the options some riders will need to decide is whether to buy their bike equipped with 29 inch wheels or use the 26 inch wheels. That could be a tough choice to make! Either way, if you are thinking about buying a mountain bike, you couldn’t make a better decision than buying a Specialized mountain bike! Thanks to VitalMTBVideos for creating the awesome mountain bike video!